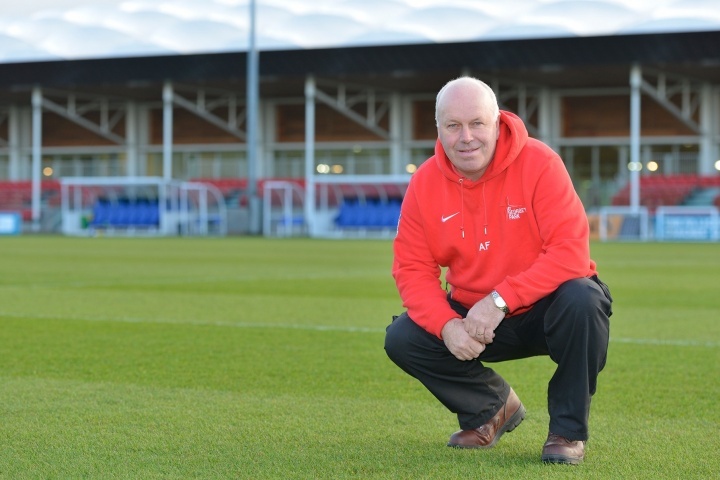 The man in charge of pitches at St George's Park and Wembley, Alan Ferguson, answers our questions on the maintenance of football goals and offers advice for all football groundsmen across the country. How do you maintain football goals, nets and equipment at St George's Park? We do a weekly check over all of the equipment here and I think we have something like 146 goals of some type or other, team shelters, ball-stop netting – all of that has to be checked. It ticks a health and safety box and it also ticks the goalpost safety register. Once a year, your guys come up from Lowestoft and we do a complete MOT of all the equipment and anything that's maybe had a hard life, like netting, hooks, the smaller sundry bits, we replace as required. The posts are never an issue. What advice would you give on looking after goals and nets? I think it's so important that people now get the right goals. For a long time, particularly in the grassroots game, there was a big, big problem with cup hooks, rusted posts and home-made goals that just weren't fit for purpose. Sadly, there were a number of high profile accidents the length and breadth of the country. One accident was one too many and they were all preventable. You should never be injured on a goal, going out to enjoy yourself to play a game of football, whether that's kids at school, people here at St George's or down in your local park so I think it's really important that someone in a club, regardless of where the club is or what size the club is, takes that responsibility to have a five-minute check over the equipment. Get the right equipment. We, as a national association, have made grants available so now clubs can do that. You shouldn't have three scaffolding poles welded together now. These should be long, long gone and I think that we owe it to the players that play the game, particularly the younger kids, to have as safe equipment as possible. What checks do you make before the start of the football season? We've come through the MOT check so we know we're in pretty good shape. It's then down to a quick check ahead of every game – the nets, the posts, the back poles, to make sure everything's done. We now have the new safety padding on the back poles which is in line with UEFA. We've introduced that on all our match pitches and I know it's something we're encouraging member clubs to do at their grounds as well. I think they can do exactly the same. What we do is pretty simple and straightforward, it's just repetitive. I think it's getting into a good habit, developing that good habit and doing that on a very regular basis. If we have two games on a day on the same pitch, we'll check twice – it's 10 minutes, it's no time at all. It's so important because if something goes wrong it could be catastrophic for a player or us as a business. What would make their lives easier and ensure they spend their time as efficiently as possible? Most clubs run on a committee type basis and you probably don't want the onus to fall on one person, so maybe if a couple of people can get together to do the checks then I think it's a pretty straightforward, simple thing. When we do tours of the park here and we have grassroots clubs in particular, we do try and emphasis that. If you had one piece of advice for club groundsmen, what would it be? Just get the right equipment for your game – don't take a chance. Try to develop a bit of education, a culture around your club. The kids will see professional footballers swinging on a crossbar at the Etihad Stadium: Don't do it at your club because it's not supposed to be done. We do try and educate the pros when they're here because they're role models for the kids so the big piece of advice would be try and introduce some sort of education at your club and just try to make people aware. Here, we said 'make goalposts your safety and make safety your goal'.